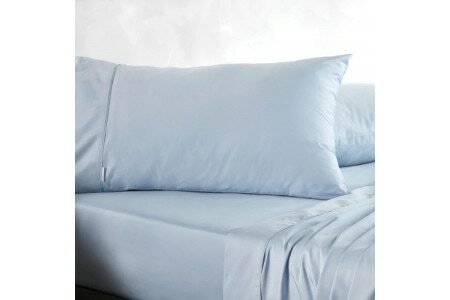 Silky smooth with a lustrous sheen, our Soft Sateen sheets are also exceptionally strong and durable. The combined properties of beautiful, fine-spun 100% cotton yarn, a super-smooth sateen weave and a 400 thread count, create a sheet with a softer drape and a gleaming finish. Perfect for everyday use, yet luxuriously comfortable, these sheets are easy to care for with their ability to be line or tumble dried. 400tc Soft Sateen standard pillowcases come as a pair. 400tc soft sateen pillowcase pair is rated 4.5 out of 5 by 15. Rated 5 out of 5 by MickyB from Extras Needed I required extra pillow cases as I soil them very quickly with my obviously oily facial skin. Soaking the original removed the stains, but was fading the colour. I have purchased these extras, so I can change the cases daily. Rated 5 out of 5 by ozzie from BEAUTIFULPRODUCT We purchased these to add to our linen collection of which we only have Sheridan. The fact that these are Sheridan branded gave us peace of mind even before we received them. Of course upon arrival with usual Sheridan five star postage accuracy, we were thrilled. Tried them last night for the first time and fell asleep feeling like the king of Australia! Absolutely PURE quality, looks and feel. Rated 5 out of 5 by Vozy from nice pillowcases I am always happy with Sheridan products. Lovely & soft. Rated 5 out of 5 by donna13 from pillow cases I love my Sheridan pillowcases. I do have Sheridan sheets in my collection at home, I have tried other brands, but keep going back to Sheridan. Rated 5 out of 5 by Lynne13 from Great feel, easy care fabric. I bought the pillow cases to as extra's for the sheet sets. All of my sheets, bedcovers and towels are Sheridan. I love the feel of the fabrics and they wash really well.